Our first EEBIO’s example of distribution of the species in the Region – i.e. in the Carpathian Mountains – has referred to Popov et al. . Main distribution: Mountains of the European part (the Carpathians, the Khibiny, the Polar Urals); habitats – tundras and alpine habitats up to 2,500 m a.s.l. Flight period: May-August in a single generation. Host plants (Henriksen, Kreutzer, 1982): Malva and Alchemilla (A. glomerulans in Fennoscandia) – http://rusinsects.com/hesperid/hes-p-an.htm In accordance with Old IUCN status categories it is R-species i.e. ‘rare’ – with small populations that are not present ‘Endangered’ or ‘Vulnerable’, but at risk. Mostly these species are localized within restricted geographical areas or habitats or are thinly scattered over a more Extensive range. Categories and criteria for the national threat status is ‘VU’ i.e. vulnerable . 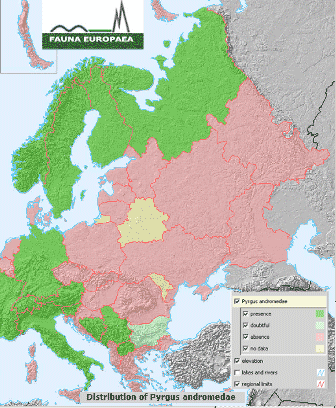 Interactive EU GIS ‘Faina Europea’ demonstrated that in main part of EEBIO areas it is ‘absence’ (rose) or ‘no data’ (yellow) – see the picture. GLM scenario demonstrated: 1) habitats presence in Ukraine, 2) habitats erosion in Ukrainian part of Carpathian Mountains and the trend ‘decreasing locally’ by 2050, 3) its habitat analogy appearance so far to the SW – figure. RS-, GIS- and other sources were used for modelling. 1) Popov, 2005. SW Ukrainian butterfly database: report 1973-2005, Lepidoptera: Papilionoidea & Hesperioidea /S.G. Popov. Uzhgorod, 2005. 2) European Butterflies and Skippers (vrs. 2.1) -<http://www.tyllinen.eu/Butterflies/Hesperiidae/Maps/PYRandro.png>. 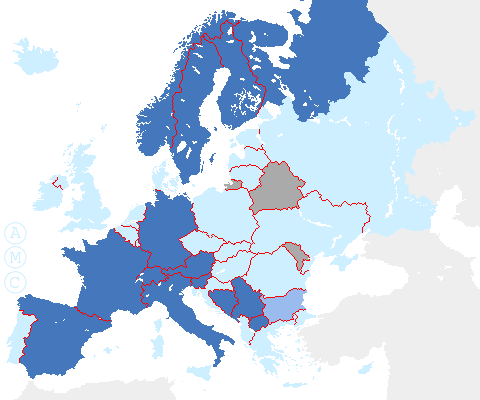 3) Distribution of Pyrgus andromedae/ Fauna Europaea – <http://www.faunaeur.org/Maps/display_map.php?map_name =euro&map_language=en&taxon1=83756> . 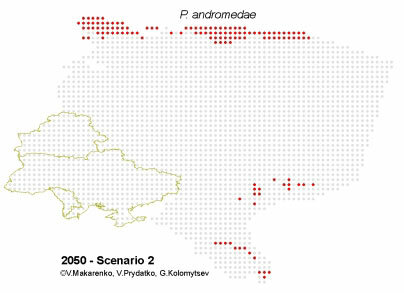 New GLM Scenario 2 demonstrated: local decreasing in Carpathian Mountains (in Ukraine), habitat appearance in SW and in southern part of areal of the species in Russia – figure.